This is the last post in the series on confusing words. 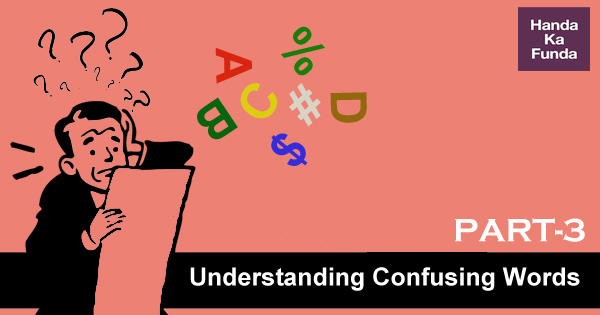 If you haven’t read them already, check out Understanding Confusing Words – Part 1 and Understanding Confusing Words – Part 2. where we have discussed a list of important words that you should know if you want to save some time in the verbal section of CAT, IIFT, XAT or any other MBA entrance exam. In this post, we will first look at a few more words and then we will talk about how to use of the words you have learnt through these posts. Why is this important? Because skimming through blog posts will not help much. When you’re reading some question in the exam and realise ‘Oh I know this word but don’t remember what it means’ you will miss doing a thorough read up on the words we discussed. We will get to this later, first, let us discuss the words for this post and get them out the way. Imminent vs. Eminent – Imminent means likely to occur at any moment. It refers to something that’s approaching, about to happen, or anticipated. For e.g. “While she was waiting, she one day received a letter from Tony, announcing his imminent arrival in Mumbai. Apology vs. Apologies – The phrase my apologies is an idiom, while the phrase my apology literally means my act of apologising. As an idiom, my apologies means excuses or regrets. This phrase is a way of saying you’re sorry. The phrase ‘my apology’ is not an idiom. It only has a literal meaning. It means an act of saying you’re sorry. For example, I think you owe me an apology. Extant vs Extent – Extant is something that’s still around — you’re surprised it’s not extinct. It’s more than just existing but also surviving when others have not. For e.g. The roots, stumps, trunks, and foliage found in bogs are recognised as belonging to still extant species. Extent means the range of something. Extent can also refer to a degree of something, such as goal achievement. Extent is also the space something covers or takes up. You may have read the phrase to a lesser extent (not as much), or greater extent (more) to show the degree of variation. For e.g. Demonetization did not affect the urban rich to a large extent. Contemptible vs. Contemptuous – Contempt is a noun that describes the feeling that someone is beneath you or the state of being despised. The –ous ending means “full of,” so contemptuous means “full of contempt, showing scorn.” It refers to the person or thing showing the scorn. Remember, then, if something is able to be scorned, it is contemptible. If someone or something is full of contempt, it is contemptuous. Emigrate vs. Immigrate – The choice between emigrate and immigrate depends on the sentence’s point of view. Emigrate is to immigrate as go is to come. If the sentence is looking at the point of departure, use emigrate. For e.g People are always saying there’s no quality of life here, and everyone wants to emigrate. If you are referring to the point of arrival use Immigrate. For e.g. Citizens from European Union countries were given freedom to immigrate to Switzerland in 2007. Bonus Tip: Talking about the actual process of moving? Use migrate. Afflict vs. Inflict – If something afflicts you, it hurts. Cancer, death, arthritis or even bad skin can afflict you. For e.g. It’s also quite likely that he was afflicted with an eating disorder. Inflict is meaner. It’s more aggressive — it actively hurts and causes problems. A self-inflicted wound is when you hurt yourself. For e.g. Some participants in the debate said the rule could unintentionally inflict economic harm on Africans. The difference between the two is whether the emphasis is on the one suffering or the one causing the suffering. Afflict emphasises who is doing the suffering. Inflict emphasises the person or thing causing the suffering. Climactic vs. Climatic – Climactic comes from climax. A climax is the top point of something, so something climactic describes that intense moment. Climactic is often used in the negative, anticlimactic, like when there’s a build-up to something that falls short. Climatic refers to weather conditions. The word climatic gets thrown around a lot these days, with all the talk about global warming. For e.g. The panellists discussed the unpredictable climatic disasters that have occurred in many parts of the world. Abhorrent vs Aberrant – Abhorrent means disgusting or detestable. When you abhor something, you loathe it. Its Latin root means, “to shudder, recoil,” which is what you do when faced with something abhorrent like a zombie. Biannual vs. Biennial – The difference is very simple. Biannual is something that occurs twice in a year. If you remember your Geography from school, Equinoxes are biannual; one happens in March and in September. If you want to avoid the confusion, you can use semiannual instead of biannual. Both words mean the same and semiannual makes it a little less confusing. Biennial, on the other hand, is something that occurs every two years. For e.g. the Aero India Expo that is held in Bangalore is a biennial event. 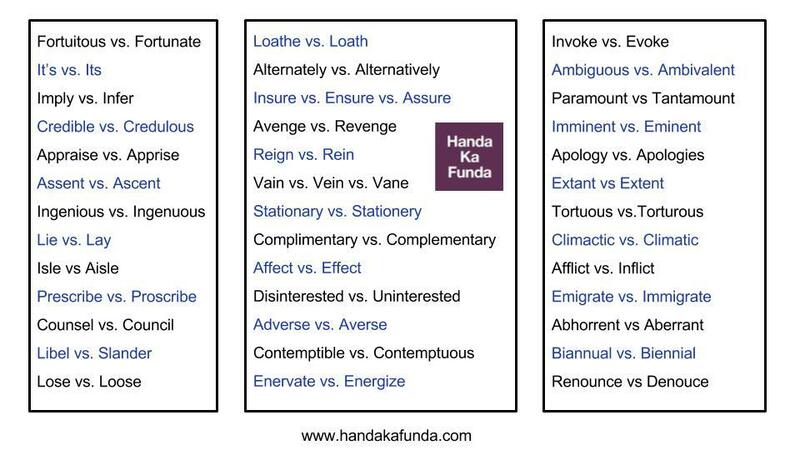 Renounce vs Denounce – Renounce is a verb and has two main senses. The first sense of the word is to give up or relinquish (a title or possession), especially by formal announcement. For e.g Due to mounting pressure, he was forced to renounce his claim to the throne. The second sense of the word is to declare that one will no longer engage in, adhere to, or support; to reject or disown. For e.g. Once he became sober, he renounced his old lifestyle. Denounce could mean to condemn openly as being wrong or reprehensible. For e.g. The Prime Minister denounced the violence and called for peace. Remember – You might renounce an old habit or lifestyle or renounce your support for something, but you denounce other people’s words or actions. We had discussed learning strategies before, and if you have been reading this series on confusing words, you now know a lot of new words. You can use this chart below to quickly go through these new words. If you find a word you are not familiar with, look it up and also check out some sample sentences. Spaced repetition will help in retention and make it easier for you to recall the meanings when you need them during the exam.